The use of ALA-PDT is not limited to the treatment of AKs, BCCs, and SCCs. PDT therapy has long been recognized as an important treatment in acne vulgaris and other disorders of the pilosebaceous glands. 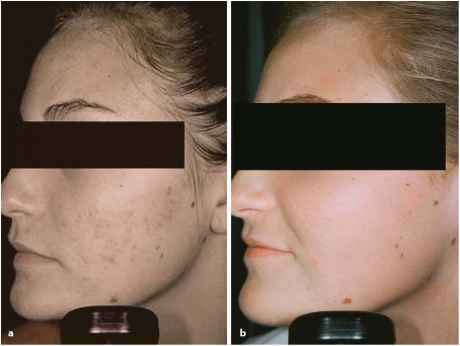 Recent advances have made the use of a variety of lasers and light sources combined with ALA practical for those suffering from acne vulgaris and other pilose-baceous entities. Acne vulgaris accounts for over 30% of all dermatology visits. It has been estimated that between 70% and 96% of all individuals will suffer from acne vulgaris at some point in their lifetime. Recent evidence suggests that over 40 million American adolescents and 25 million American adults are affected by acne vulgaris. 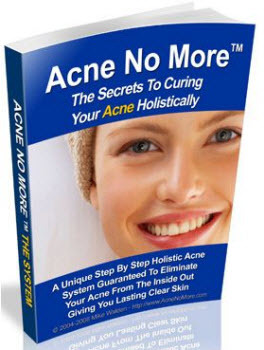 In its simplest form, acne vulgaris is a disorder of the sebaceous glands. Obstruction of the sebaceous glands leads to the production and proliferation of bacterial growth within the sebaceous glands. The bacteria most commonly associated with the formation of acne vulgaris is Propionobacterium acnes (P. acnes). Inflam matory acne presents with papules, pustules, and cysts. There are a variety of effective medications to treat those individuals suffering from acne vulgaris. These include topical and systemic antibiotics, topical benzoyl peroxide, topical salicylic acid derivatives, and a variety of topical sulfa preparations. Topical and systemic reti-noids round out the successful medications for the treatment of acne vulgaris. Despite continuing advances, there are drawbacks to each group of therapies. Some of the topical medications are irritating to the skin and may cause clothes to stain. Most topical therapies are slow to achieve an acceptable onset of action, some requiring several months to become successful. Systemic antibiotics, the mainstay for inflammatory acne for many years, have recently been reported to show up to a 40% drug resistance with the commonly used oral tetracyclines, ery-thromycins, and sulfa derivatives. A recent report has even suggested that the long-term use of systemic antibiotics in women may be associated with a higher incidence of breast cancer (Velicer et al. 2004). Exposure to natural and artificial UV light has been reported to be successful in the treatment of acne vulgaris (Sigurdsson et al. 1997). 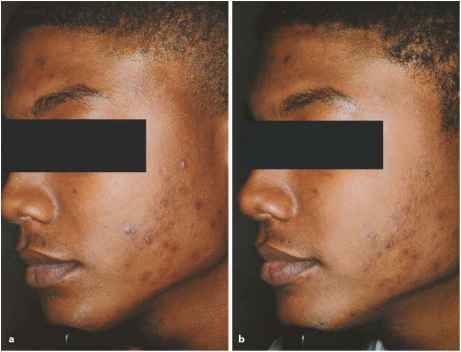 The exact mechanism for this response of acne-form lesions to UV light is not fully understood but is felt to be due, in part to, destruction of P. acnes bacteria in the sebaceous unit. This natural endogenous PDT reaction works well in the treatment of acne vulgaris; however, the damaging effects of UV light with regard to pho-toaging and the development of skin cancers precludes its regular use in today's medical environment. The photodynamic reaction seen in the destruction of the P. acnes bacteria involves the natural production of porphyrins seen during the growth of the P. acnes during the inflammatory phase of the acne cycle. The porphyrins produced are principally PplX and Coproporphyrin III, which have absorption spectra in the near ultraviolet range of light, in the blue light range, with peak absorption seen at 415 nm. The PDT reaction leads to photoactivation of the P. acnes' porphyrins after exposure to the appropriate light source. This causes the formation of singlet oxygen within the bacteria. Ultimately, destruction of the P acnes bacteria will occur, with resultant destruction of the acne lesion, leaving surrounding tissues and structures fully intact. 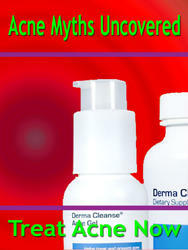 A variety of light sources have been used over the past century to treat acne vulgaris. These have included halogen, xenon, and tungsten light sources. More recently, investigations have focused predominantly on blue light and ALA, blue light alone, vascular lasers, and a variety of light sources. These lasers and light sources all utilize the concept of PDT and the destruction of the P. acnes. Still other lasers focus on destruction of the sebaceous gland and sebaceous gland activity output. Both groups will be reviewed. The treatment of inflammatory acne vul-garis with blue light sources has been extensively reviewed over the past several years. Papageorgiou (Papageorgiou et al. 2000) reported his findings with a blue light source. He showed that 63% of inflammatory lesions responded to blue light and 45% of comedonal lesions also responded. Other investigators showed that 65% of inflammatory acne lesions responded to blue light therapy. A new high-intensity blue light source has also recently been evaluated for its effectiveness in the treatment of inflammatory acne vulgaris (Elman et al. 2003). Investigators have shown between 60% and 75% improvement with this high-intensity blue light source. Most of the clinical trials have evaluated two treatments per week for 4 weeks with appropriate 1- and 3-month follow-ups. These clinical trials had, on average, a 20% non-responder rate. Gold (Gold 2003) reported his findings with this blue light source in 40 individuals with mild to moderate inflammatory acne vulgaris. Treatments were conducted two times per week for 4 weeks, with follow-up at 1 and 4 months. The results of this trial showed a 43% improvement in inflammatory acne (Figs. 6.9, 6.10). A different blue light source has also been shown to be more effective than topical 1% clin-damycin solution in treating inflammatory acne vulgaris during a 4-week treatment period with a 1-month follow-up time period (Gold 2004b). action for IPL is similar to that seen with blue light therapy; that is, destruction of the P. acnes leading to a PDT effect. In one IPL study, 85% of patients showed greater than 50% improvement in their acne lesions. Unfortunately, i5%-20% of the patients were nonresponders. Other investigators have looked at other laser systems whose primary effect may be the destruction of the sebaceous glands themselves. Lloyd and Mirkov (Lloyd and Mirkov 2002) evaluated the use of a 810-nm diode laser with application of indocyanin green. The indo-cyanin green is selectively absorbed into sebaceous glands and can be destroyed with exposure to the 810-nm diode laser. Paithanker et al. (Paithankar et al. 2002) have studied the 1450-nm laser for the treatment of inflammatory acne lesions. 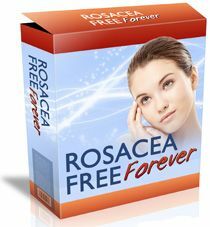 Their clinical evaluations have shown significant destructions of the sebaceous glands with this therapy and long-lasting resolution of the acne lesions. Recently, a group of investigators has begun to evaluate the use of ALA as an enhancer for the laser and light therapies. Hongcharu et al. therapy, also returned. Again, a classic PDT reaction occurred following the therapy with erythema, edema, and crusting noted in the patients following treatments. Goldman (Goldman 2003) reported on the use of short-contact ALA-PDT with either IPL or a blue light device for the treatment of acne vulgaris and sebaceous gland hyperplasia. Treatments were noted to be pain free and without adverse effects. 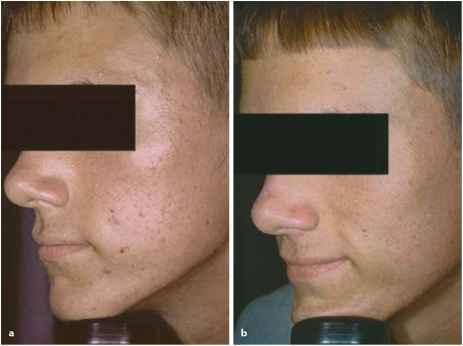 Relative clearing of the acne lesions were seen after 2-4 weekly treatments. Gold (Gold 2003) evaluated ten patients with moderate to severe acne vulgaris utilizing full-face, short-contact ALA-PDT and a high-intensity blue light source. Four weekly treatments showed a response of approximately 60% (versus 43% with the blue light source alone). Sessions were well tolerated with no noted adverse effects. Goldman and Boyce (Goldman 2003) also studied acne vulgaris with a blue light source with and without ALA in 22 individuals. Blue light therapy was performed alone twice per week for 2 weeks with a follow-up at 2 weeks; blue light plus ALA was performed two times at 2-week intervals with a follow-up at 2 weeks after the final treatment. There was a greater response in the ALA-PDT/blue light group than blue light alone with no significant adverse effects seen in either group of patients. Gold (Gold 2004a) has now been evaluating a new IPL for moderate to severe acne vulgaris with ALA-PDT. Twenty patients were evaluated and results show significant improvement in inflammatory acne lesions; similar to previous studies performed by the author with blue light and ALA (Figs. 6.11, 6.12). 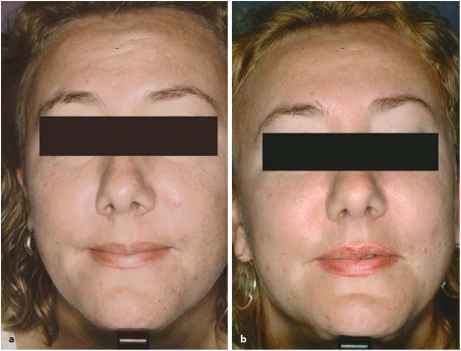 The combination of full-face, short-contact ALA-PDT treatments with blue light sources, IPLs, and other lasers and light sources appears to provide a synergistic effect to effectively treat patients suffering from moderate to severe inflammatory acne vulgaris. The combination therapy has been shown to be safe; it appears to work at a faster rate than lasers or light therapy alone, with fewer required treatments. This combination therapy may eliminate the need for more intensive systemic therapies in some of our patients. Several other medical conditions are also being treated with ALA-PDT. Our group has recently reported on the successful use of ALA-PDT and a high-intensity blue light source in the treatment of hidradenitis suppurativa (HS). Four individu als with recalcitrant HS were treated with short-contact ALA and between three and four sessions of the blue light source. The treatments were given at 1- to 2-week intervals. Seventy-five to one hundred percent of the HS lesions responded to this therapy and remained clear during a 3-month follow-up period. (Fig. 6.13). 10-20% of lesions were seen within 3-4 months of the final treatment. Our group has also examined short-contact ALA-PDT in a group of patients who received either IPL therapy or a high-intensity blue light source. Results from 4 weekly treatments show both therapies useful in the treatment of sebaceous gland hyperpla-sia, with 50% of lesions responding during the treatment and a follow-up period of 3 months. (Fig. 6.14). What is acne? Certainly, most of us know what it is, simply because we have had to experience it at one time or another in our lives. But, in case a definition is needed, here is a short one.